Taking the following steps can make a hospital stay easier to manage for both you and the person with cancer. As a caregiver, you are an important part of the health care team. You can provide information about the person's health choices to team members. By doing this, you will help the doctors and nurses give better care. Get to know the nurses who are caring for the person with cancer. Let them know that you will be the point of contact for the person with cancer. Nurses are key sources of information and support and can answer many of your questions. 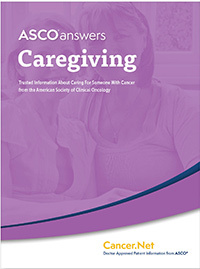 They can provide practical tips for caregiving and tell you where to find more information. They can also help you understand medical procedures and hospital processes. Meet with the attending doctor and explain that you want to be informed of important test results and medical decisions. Also, give the doctor your contact information. As a caregiver, this information should be in the patient's hospital record. You will also want to ask for the best way to reach the doctor. You should also keep a running list of questions. Find out when the doctor will be visiting patients so that you can be there to get your questions answered. It also helps to write down or record the answers. Hospital rooms may have whiteboards you and the staff can use to write questions or comments. If you don't understand what the doctor is saying, ask him or her to provide more explanation. It's OK to speak up. A social worker or case manager can help in many ways. This help may include understanding insurance issues, finding financial and travel support, and coordinating care between doctors. They can also provide information on local caregiving resources. At the end of a hospital stay, they often help with planning issues, such as follow-up care. As a caregiver, you are often responsible for many tasks. These can range from making appointments and filling prescriptions to handling insurance and billing issues. Better organization can help you feel less overwhelmed by all of the information that you have from the hospital. You may wish to create a system for filing paperwork. A simple 3-ring binder with folders and tab is one option. This will help you to quickly find what you need, saving time and reducing stress. In addition, keep a list of the patient's medications and allergies with you. This list may include each medication's name, purpose, dosage, and time of doses. Power of attorney. In this document, a person names a health care proxy, also called a health care agent. This is another person who can legally make health care decisions on the patient's behalf if he or she is unable. Living will. This written set of instructions outlines the types of life-sustaining end-of-life medical care a person would or would not want. A living will can include a do not resuscitate order (DNR). This instructs medical personnel to not give cardiopulmonary resuscitation (CPR). CPR is the attempt to restart a patient's heart and breathing if it has stopped. The patient's doctor must complete and sign a DNR order. In some states, there are out-of-hospital DNR or physician orders for life-sustaining treatment (POLST). They allow EMS personnel to give medication to relieve the symptoms and side effects of cancer and its treatment. Make sure that these documents are in the patient's medical record and that the health care team is aware of the patient’s wishes. If the person with cancer does not have these documents, talk with him or her about creating them. It may be possible to complete the forms in the hospital.